Over the past several years, opioid use has become a hot topic. Called the "opioid epidemic" by news outlets and others, the public's conversation largely revolves around the rising rates of addiction and abuse in the United States. It touches on overdose deaths, the ease of opioid procurement, and the most impacted areas of the country. But the real conversation extends well beyond the headlines. Opioids are not simply used to get high. They are often appropriately sought by individuals struggling with chronic pain and prescribed by physicians with limited alternatives. "For some conditions, opioids may be medically necessary for individuals experiencing prolonged and intractable pain, and most patients take medicine as prescribed," says Eric Garland, PhD, LCSW, a presidential scholar, associate dean for research, and an associate professor in the University of Utah College of Social Work and associate director of integrative medicine in supportive oncology and survivorship at the Huntsman Cancer Institute, both in Salt Lake City. "Nonetheless, opioids rarely completely alleviate chronic pain and may lead to serious side effects, including death by overdose, as well as risk for developing opioid-related problems and addiction. "Additionally," he says, "prolonged use and misuse of opioids can alter the brain in ways that make it difficult to cope with pain and experience pleasure in life. As such, nonopioid pain treatments are needed to target chronic pain and prevent opioid misuse." Fortunately, clinicians and researchers throughout the country are working toward those alternatives, looking to replace or supplement a treatment that has also become an increasing concern with variations in efficacy. "Researchers are studying cognitive behavioral therapy [CBT], acupuncture, exercise, nutrition, neurofeedback, and electrical/magnetic brain stimulation as nonopioid pain treatments," Garland says. "All of these approaches appear to be promising." "There is reason to be optimistic that physical therapy, yoga, and approaches that involve meditation are useful to address chronic pain," adds Mark Ilgen, PhD, a psychologist with the Ann Arbor VA Health System and an associate professor with the department of psychiatry at the University of Michigan. 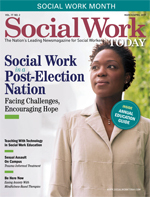 In this article, Social Work Today looks at two different approaches to alternative treatment—approaches studied through clinical trials by Garland and Ilgen, respectively—in an effort to gain an understanding of some of the options in development. One such currently researched nonopioid pain treatment is mindfulness. Garland currently leads "three federally funded research trials from the National Institutes of Health and Department of Defense to study Mindfulness-Oriented Recovery Enhancement [MORE]," he explains. Developed by Garland himself, MORE aims to target chronic pain and prescription opioid misuse. "MORE is an integrative therapeutic approach that unites a traditional mindfulness meditation-based intervention approach with techniques drawn from 'third-wave' cognitive behavioral therapy and even existential therapy, along with a positive psychology emphasis that acknowledges the importance of enhancing positive emotion through savoring." According to Garland, there are three techniques used within the intervention: mindfulness, reappraisal, and savoring. "Mindfulness involves focusing attention on present-moment experience to both accept and gain greater self-control over automatic cognitive and behavioral habits," he says. "Reappraisal involves reframing or reinterpreting stressful life events in such a way as to view those events as a source of meaning or personal growth. Savoring involves mindfully attending to and appreciating healthful, beautiful, and life-affirming events as a way to enhance positive emotions and the sense of reward." Having conducted several randomized controlled trials, Garland says that the findings are promising. MORE appears to have positive therapeutic effects on participants, as it teaches them ways to approach and assess their pain. "In MORE, we teach patients to focus mindful awareness on pain to gain greater awareness of the physiological condition of the body. Rather than distract themselves from pain, we encourage patients to 'step back' from their emotional reactions to pain and then to focus awareness on the pain by breaking down the experience into its subcomponent sensations," he says. "Instead of thinking of low back pain as a terrible, awful experience, we teach patients to focus on the sensation of heat, tightness, and tingling in the back. In doing so, [the patients] may find that the spot of pain is smaller than they thought or that there are spaces inside of the pain sensation that don't hurt at all." The data, Garland says, indicates that individuals with chronic pain on long-term opioid therapy benefit from MORE. "The data is showing that MORE helps people become less fixated on stress and drug-related stimuli by helping them to shift their attention away from those stimuli. At the same time, the data shows that MORE improves self-regulation of the autonomic nervous system while viewing stress and opioid-related cues," he explains. In addition to focusing solely on nonopioid pain treatments such as mindfulness and other intervention models, researchers must also look at management techniques that coincide with addiction treatment. "There are a lot of pathways between pain and addiction," Ilgen explains. "Many people report that addiction followed an initial injury or surgery and they developed a substance use disorder through the process of attempting to cope with pain. The reverse is also true. A substance use disorder may develop first and then the person develops chronic pain at a later point in time. "Even though there are many different pathways to having a co-occurring substance use disorder and pain, there is clear evidence that having one condition is associated with worse outcomes for the other condition," he adds. Through his work, Ilgen has observed that many of the individuals with co-occurring chronic pain and addiction had even more limited options available to them. "Treatment providers were concerned about prescribing opioids to those with substance use disorders, and the patients felt that their existing treatment regimen wasn't addressing both of these problems that they believed to be interrelated." As a result, Ilgen and his colleagues designed a study specifically to be used for individuals with pain and addictive disorders. "We wanted to develop and then test a new psychosocial intervention to help manage co-occurring pain and substance use disorders. We used a CBT approach with a focus on pain acceptance. There is literature on CBT for pain management that stretches back 20 to 30 years that shows good effects," he explains. "We added content related to pain acceptance because several newer trials of acceptance-based interventions have shown promise in improving pain-related outcomes." The study was a randomized controlled trial with a comparison group that took place over the course of a year. Conducted at a VA drug and alcohol treatment program, the participants were primarily male—a circumstance of both the location and the population, Ilgen notes. "The majority of VA patients are male and most are over the age of 40. Also, men are much more likely to receive drug and alcohol treatment than women." A second trial is currently under way with a more balanced gender makeup. The participants took part in group sessions that focused on varying aspects of the individuals' pain, relationship to the pain, and functioning. "The idea behind the acceptance-based intervention was adapting to the reality of the chronic pain in someone's life." Ilgen says. "In a lot of cases," he notes, "there's not an easy cure for the chronic pain condition. We tried to have a stance that was realistic and of the treatment focused on helping people identify strategies for adapting to the pain." A significant aspect of the intervention involved talking about coping strategies as well as pleasurable activities that the pain and/or the addiction have made less prevalent in the individuals' lives. "We tried to encourage the participants to be strategic about what they are doing in terms of physical activity. We talked to them about what sort of pleasurable activities they were giving up because of their pain. The theory behind this is that, as people experience more pain, they withdraw from their pleasurable activities. They are less active. Working through the pain becomes less possible. The goal of the treatment is to work against this pattern and help patients become more and more active and engaged in their lives with the assumption that this will decrease depression and improve functioning." As with Garland's studies, Ilgen's outcomes were positive. "The main outcomes we looked at were pain level, pain-related functioning, days of alcohol use, and days of drug use. We saw positive effects: reductions in pain level, increases in functioning, and decreases in days of alcohol use." The study did not show a notable decrease in days of drug use. Ilgen attributes at least some of this to limited overlap in the types of drugs participants reported using. This limited the statistical power to examine effects within specific drug classes. It is also possible that specific types of drug use are less responsive to pain management as an intervention. The above are just two examples of the work being done to provide alternatives to opioid pain management. And the researchers know that their interventions will not and should not be the only additional options developed. Different approaches work for different individuals. Thus, it is hopeful that the alternatives to opioid pain management continue to be developed and tested with positive results, as the need continues to grow. "In my experience," Garland says, "medical professionals are hungry for nonopioid therapies for chronic pain."